There are four sets of Lectionary readings for Christmas. Below is a generic outline which can be used with any of the readings for Christmas. It focuses on the four Gospel readings of the day and so the whole Christmas story as told by Matthew, Luke, and John. God has come down to dwell with us in order to save us from our sins. These are his names: Jesus, which means Savior, and Emmanuel, meaning God is with us. His ancestral line from his foster-father’s side passed through all the kings and patriarchs of Israel. The savior who is Christ and Lord is born in the city of David (because his foster-father is of the house of David). This is announced to lowly shepherds by glorious angels. His cradle is a manger because there was no room for them at in the inn. 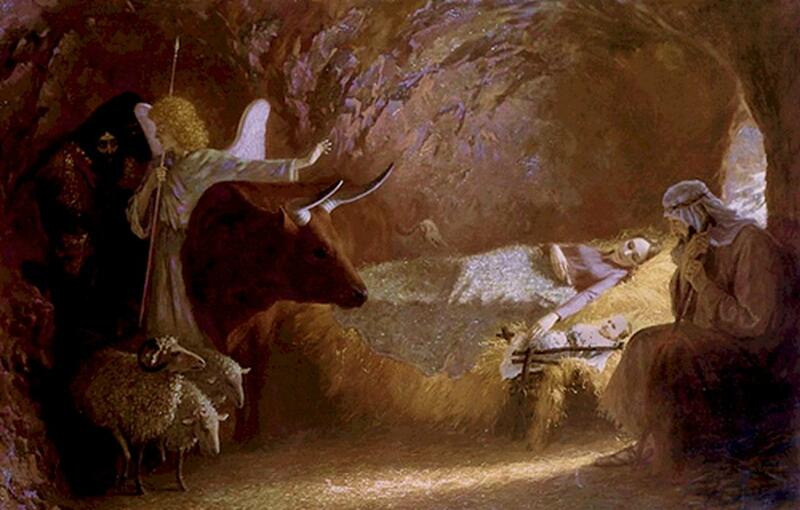 The shepherds verify with their own eyes what was announced to them by angels. They felt joy and glorified and praised God. They announced to their peers all they had heard and seen, which amazed those who heard. Mary kept all these things, reflecting on them in her heart. The Prologue to John’s Gospel tells us this savior who came into the world is the mysterious figure of the Word of God, the only Son of the Father, who existed before the universe, through whom the universe was created, who now brings new life of grace and truth, who makes us children of God. It is very understandable that we celebrate Christ’s birthday. This was the day Christ became visible and public for all to see. He was glorified by lowly shepherds and later by Magi. In the Church’s calendar, this is the second or third most important feast—Easter being first and Christmas or Pentecost being second. Perhaps one day the Annunciation, which we celebrate on March 25, will become as important as Christmas, because the Annunciation commemorates the Incarnation, when Christ actually came into the world, just as our real origin is not the day we are born but the moment we are conceived. Conception is invisible to our eyes but real. The doctrine of the Incarnation is this: The Second Person of the Blessed Trinity, a Divine Person with his Divine nature, united to himself a full human nature (intellect, will, and body), without Original Sin, and began to live in his creation, first as a zygote, then as an embryo, then as a fetus, then he was born in the most humble of circumstance in the city of his kingly human ancestor, and continued his divine-human life. He did all this to redeem us from our sins and from death. He accomplished our redemption through every act he performed on earth and everything he experienced, above all in his public life of teaching and miraculous signs, and finally, in his Passion and Resurrection. This is what his name, Jesus or he saves, means. It is what Emmanuel, God is with us, means. We should reflect on this in our hearts, like Mary did. Our Christian heritage has dressed Christmas in great beauty and delight, and rightfully so. The basic reason for joy at the birth of Christ is because he is our savior. He saves us from sin and death. Do we see that we are sinners? Original Sin is the wound we carry in our human nature. And we sin by act and omission in thought, word, and deed. The saints knew they were capable of any crime. Also, we are what philosophers call contingent. We didn’t bring ourselves into existence and we will someday die. In the meantime, all kinds of bad things can happen to us and those we love. But Christ is our savior. He forgives our sins, makes us children of God, and will give us an eternal life of happiness and holiness with him and with all the saved forever, if we want it. Why bring this up on Christmas, when everyone is dressed in their best, there are so many children here, our homes are decorated, lots of good food is waiting at home, family gatherings are anticipated, and in general the best of human nature is on display? Is this really the time to talk about sin, crime, evil, wretchedness, and death? I am harmless. I can’t look down on you with disapproval. I can’t speak words of condemnation or shame. I can’t kick you or hit you. There is nothing scary about me. I need to be cared for or I’ll die. I need love from you. Won’t you respond? Are you only going to look at me on Christmas? Won’t you take me home with you the rest of the year? Won’t you at least come to see me once a week? If you were honest you would admit how much you need me. I’m trying to make it as easy as possible for you to come to me to be saved.